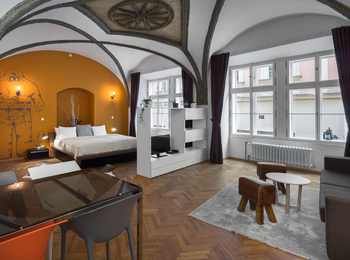 7 Tales Suites is an apartment hotel located in the historical centre of Prague on the Royal Pathway just 200m from Old Town Square. 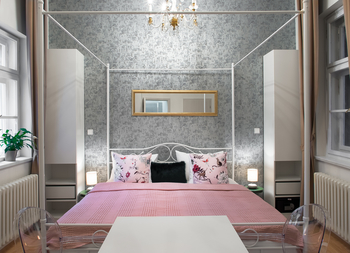 The residence offers a unique living experience during your stay in Prague. 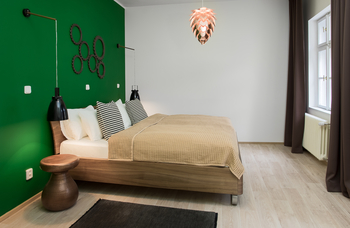 The interior design of each apartment is inspired by a famous traditional Czech tale. All rates include daily cleaning, fresh towels, bed linens and ecological hotel toiletries. Each bedroom offers comfortable King size beds with high-mattresses. Fully equipped kitchens for self-catering at your disposal in each apartment. Private parking near the residence available for an additional fee (advance reservation needed). Beautiful accommodations with centered location just walking distance from anywhere. The staff was very friendly and helpful, always available whenever needed. Value provided is well worth the cost. Helpful staff. Loads of space - 2 large double rooms for just the two of us! Perfect location. All facilities modern and worked fine. Small opening into bathroom ceiling that needs fixing. Would definitely stay again. It was such a great hotel in a great location. Each floor has a different theme. There is a water cooler to fill up your water bottle on the bottom floor as well. The bathroom was nice and big. We liked that it was so close to Charles Bridge so we could wake up before all the other tourists and enjoy the quietness of it. At night the area is packed! This romantic studio is inspired by the beautiful tale of Cinderella, a story that is known all over the world. You can find Cinderella's slipper in the apartment and watch the Czech version of this story on a Blue-Ray player available in the apartment. 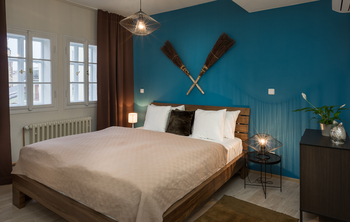 This cozy studio offers a comfy king sized bed, kitchenette and a bathroom with a shower. It creates a calm atmposhere for a relaxind day after an active day in the city.